A CD of The Iguanas' performance at the 2007 New Orleans Jazz and Heritage Festival is now available online for $15.00 + shipping. A downloadable version has recently been made available for $12.50. The set features guest artists including Eric Lucero on trumpet, Jason Mingledorff on tenor sax, Anthony Cuccia on percussion, and Jonathan Freilich and Alex McMurray on guitar. You can find the recordings of the 2006 and 2007 Jazzfests for sale by clicking the image at right, or by clicking here. If you haven't had the opportunity to see Robert Mugge's documentary about musicians who were displaced by Hurricane Katrina titled "New Orleans Music in Exile," it is still being shown in rotation on the Starz InBlack cable network. The Iguanas are featured along with Dr. John, Irma Thomas, Eddie Bo, Big Chief Monk Boudreaux, The ReBirth Brass Band, Cowboy Mouth and others. To see a schedule of air times, click here. Go to http://www.robertmugge.com/exile.html to view the official web site, including a trailer of the film. Note: On May 20, Ray Nagin won re-election as Mayor of New Orleans. Famed filmmaker Robert Mugge visited Austin, TX this week to film performances and interviews with The Iguanas for his upcoming documentary about Louisiana musicians displaced by Hurricane Katrina to be titled "New Orleans Music In Exile." In 1996, Mugge shot a film called "Iguanas in the House" about the recording of the CD Superball at Chez Flame Studio in New Orleans. His other films include documentaries about Sonny Rollins, Al Green, Sun Ra, and Clifton Chenier. The Iguanas performed this week at a special Hurricane Katrina benefit in Baltimore with fellow musicians the subdudes and The Rebirth Brass Band. Held at the popular night-spot Sonar in conjunction with Associated Black Charities, the event attracted fans of New Orleans music from the Northeast as well as cast and crew from the hit HBO drama "The Wire," and served to raise much needed funds for the victims of Hurricane Katrina. On a personal level, it was deeply moving for us as New Orleanians to experience the real deal once again...hearing and feeling the second-line vibe of The Rebirth Brass Band and being with our old friends the subdudes was like going home in a way. Click Here to see photos of a recent Texiles show at the Continental Club. The Texiles are a band of New Orleans exiles living in Texas featuring members of The Iguanas along with a revolving cast of musicians including Ed Volker (The Radiators), Tim Green (Cyril Nevile, Peter Gabriel), Jeff Treffinger (The Geraniums), and Dale Spalding (Poncho Sanchez). Other guests have included Dave Alvin and Papa Mali. Click Here to go to a page of links to Hurricane Katrina relief organizations and information sites compiled by the New York Times. 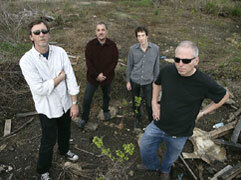 In December 2004, The Iguanas recorded a show in Memphis, TN at the Hi-Tone. This performance will be aired on the internationally syndicated radio program Beale Street Caravan. The dates for broadcast vary from station to station, but generally it will be heard the weekend of May 1st. The band's featured guests that night were Eric Lucero, trumpet, and Jim Spake, sax. Check your local FM affiliate for date and time. To find a station that carries the show, click here (if you don't have a local station that carries the show, this is a good place to locate a station that streams the show on the internet). The Iguanas have just returned to New Orleans from a successful tour of the Northeast including gigs in Philadelphia, Pittsburgh, Baltimore and Northampton, MA. NRBQ drummer Tom Ardolino (pictured) and his wife attended the gig at the Iron Horse in Northampton. The next night The Iguanas were joined onstage at the Funk Box in Baltimore by original guitarist of The Meters, Leo Nocentelli, whose own group played on the bill that night. On Saturday, June 19th, The Iguanas visited XM Satellite Radio's high-tech Washington, DC studios to record a live set to be aired on the XM 12 channel on a show called "X Country" hosted by Jessie Scott. It debuts Wednesday, July 21 at 8:00 pm Eastern, and replays Friday at 11:00 am and Sunday at noon as part of "Wired In - The X Country Concert Series." XM Radio is America's most popular subscription satellite radio service with 68 commercial-free music channels as well as 54 channels of news, traffic, weather, sports, etc. The new sound sample area of iguanas.com is almost complete. Check out the new pages for 60 second RealAudio and Mp3 samples of almost every tune recorded by The Iguanas since 1993. 4/23/04: WELCOME TO OUR NEW WEB SITE! 10:30 pm CT Saturday night, March 5: live webcast from Tipitina's in New Orleans. Also on the bill: The Geraniums. On Friday, December 10, The Iguanas taped a live concert at the Hi-Tone in Memphis, TN to be aired on the syndicated radio program Beale Street Caravan. Beale Street Caravan, the most widely distributed Blues radio program in the world, attracts more than 2.4 million listeners each week and is heard in North America, Japan, Australia, Europe, Africa and Asia. 10:30 pm CT Saturday night, November 13: live webcast from Tipitina's in New Orleans. Also on the bill: the New Orleans Klezmer Allstars. The Iguanas were presented with two top prizes last night at Gambit Weekly's 17th annual Big Easy Entertainment Awards hosted by comedian/actor Harry Shearer. The other nominees for "Best Album" were Aaron Neville, Deacon John and The Tin Men. For "Best Roots Rock Band" the nominees were The Iguanas, Sonny Landreth and The Tin Men. Check out The Iguanas in a live internet webcast from Tipitina's in New Orleans on Friday, April 9 at 10:30 pm. In New Orleans' Gambit Weekly entertainment magazine, The Iguanas are up for honors in the "Best Album" category for Plastic Silver 9 Volt Heart as well as "Best Roots Rock Band." In OffBeat Magazine's annual Best of the Beat Awards Saturday night, The Iguanas won "Best Roots Rock Band," "Best Roots Rock Album (Plastic Silver 9 Volt Heart)," and "Song of the Year (Sugar Cane)" for 2003. If you're in Austin, Texas this year for the SOUTH BY SOUTHWEST MUSIC CONFERENCE, be sure to make it to The Continental Club for the annual Iguanas gig on opening night - Wendesday, March 17. Scheduled as usual for directly after the Austin Music Awards, this year The Iguanas will share the bill with another Yep Roc band Southern Culture on the Skids. New Orleans' Gambit Weekly ran a story titled "The Year In Music" in their December 30 issue in which two of the four music writers polled listed Plastic Silver 9 Volt Heart in their top ten overall CDs of 2003. Watch The Iguanas LIVE on the internet Friday, January 23 at 10:00 pm. The Tipitina's show will also feature John Mooney and Bluesiana. 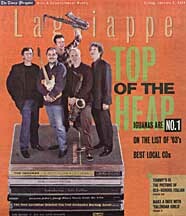 In a cover story by Keith Spera in the Lagniappe entertainment section, The Iguanas are number 1 in a list of the top 20 New Orleans music CDs of 2003. OffBeat Magazine, a New Orleans entertainment monthly, has named March 2003 release Plastic Silver 9 Volt Heart one of the Critics' Choice Top Ten New Orleans Music CDs of the past year. In addition, OffBeat has nominated The Iguanas in four categories for their annual "Best of the Beat Awards." The voting is done through ballots mailed to over 5,000 bands, musicians and music businesses throughout the state of Louisiana. The categories for which the The Iguanas have been nominated are Album of the Year, Song of the Year (three of the six nominated songs are Iguanas songs - Sugar Cane, 9 Volt Heart and The First Kiss is Free), Best Roots Rock Band, and Best Roots Rock Album. Two of four music writers for New Orleans' Gambit Weekly entertainment magazine chose Iguanas CD in top ten overall in 2003. Thanks to Christina Diettinger and Scott Jordan. Again, The Iguanas have been invited to perform at the opening of Cheech Marin's visionary traveling 'Chicano' art show which will open at the Indiana State Museum in Indianapolis in January, 2004. The exhibit consists of Chicano Visions, showcasing Cheech Marin's personal art collection of Chicano painters, and Chicano Now, an interactive multimedia installation for families. The show will eventually be seen in fifteen cities over the next five years. On Tuesday, September 2nd, 2003, The Iguanas will be in San Francisco to play a benefit at Slim's for singer/composer Alejandro Escovedo, who has been ill and unable to tour. Organized by Mongrel Music, the gig will also feature Chris Smither, Chuck Prophet & Stephanie Finch, Court and Spark, Dave Alvin, Jesse DeNatale and Peter Case. The evening will be emceed by longtime Alejandro afficianado, George Wendt. The song 'Abandonado' from the new Iguanas CD Plastic Silver 9 Volt Heart was featured on the season premier of HBO's series The Wire. The acclaimed Baltimore-based crime drama airs on HBO on Sunday nights at 10 p.m. Eastern Time.  3/3/03: Plastic Silver 9 Volt Heart reviewed on Public Radio International/BBC program "The World"